There’s something special about a luxury property. Beyond serving the obvious purpose of being a family’s home, it also is a stunning showcase of fine design. Because of that, negotiating a contract for high-end real estate can be a complex business, but the challenge has brought Suzie Wells and Aimee Simpson of Gladys Manion Real Estate a good deal of success. Some of St. Louis’ most beautiful properties have been handled by Wells and Simpson, who have more than 40 years of combined experience in the local luxury market. 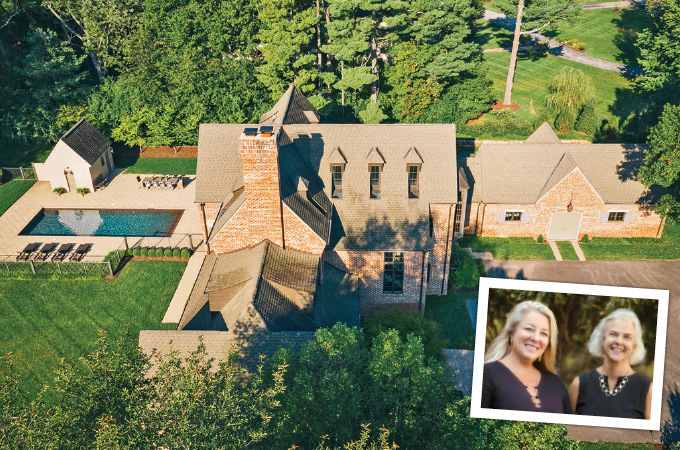 Last year, the real estate duo’s largest contract was 42 Countryside Lane, a spacious Frontenac estate that sold for $2,625,000. And they logged a comparatively low average of 60 days on the market for 2018, which speaks to their tenacity. (According to realtor.com, the overall average for the St. Louis area is about 65 days on market.) “It’s a true testament to our marketing,” Wells notes. Both agents have been part of award-winning real estate teams during their careers and say their success also is due largely to personal relationships with clients. “It’s our goal to listen with the intent to understand, not just the intent to reply,” says Wells, who is licensed as a broker and has known Simpson since they took the same real estate course in 1996. Both started their careers at Coldwell Banker and built reputations for client communication and service. The agents’ current partnership at Gladys Manion is relatively new, and they say 2018 was a year of growth. Both note that the future looks promising, too. Simpson says their marketing and advertising efforts have been well received, and that will inspire them to think creatively and build even deeper connections with buyers and sellers in the months ahead. Gladys Manion Real Estate has specialized in the St. Louis luxury real estate market for more than 80 years. 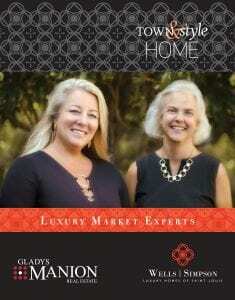 Agents Suzie Wells and Aimee Simpson, pictured on the cover, offer more than 40 years of combined experience. For more information, call 314.721.4755 or 314.973.8761 or visit gladysmanion.com.